The emergency equipment I carry in my car includes four kites, four reels of kite string, and two pairs of gloves. That’s because of what I learned as a hospital chaplain. During my training for chaplaincy certification (a rigorous 1600 hours of clinical experience in eighteen months) my assigned mentor was Joe Voss, who had decades of chaplaincy under his belt. After we’d worked together for a few months, Joe offered to teach me his secret to unwinding from the accumulated tensions of serving people who are in pain, frightened, angry, dying. He’d go fly a kite. Joe always kept his kites at the ready in the trunk of his car. One afternoon, following a particularly difficult overnight shift at the hospital in which I’d attended several deaths, Joe drove me out to a huge field behind a shopping mall. He pulled out one of his kites, got it airborne, then let me hold the string while he got another kite aloft. I was fascinated by the connection I felt between myself and that colorful nylon shape growing ever-smaller as the string played out. In a curious, gentle way it insisted that I give it all my attention. Which meant that I had to let go of the tension I was holding in my body. The powerful, distressing encounters of the previous night seemed to flow up the string, one by one, to be flung out into the sky by the dancing kite. While I tried to make a spiritual metaphor out of that piece of information, the kite string hummed, and the fabric strained against the wind, and after a few moments I couldn’t remember what I’d wanted to say, nor why it had seemed important. 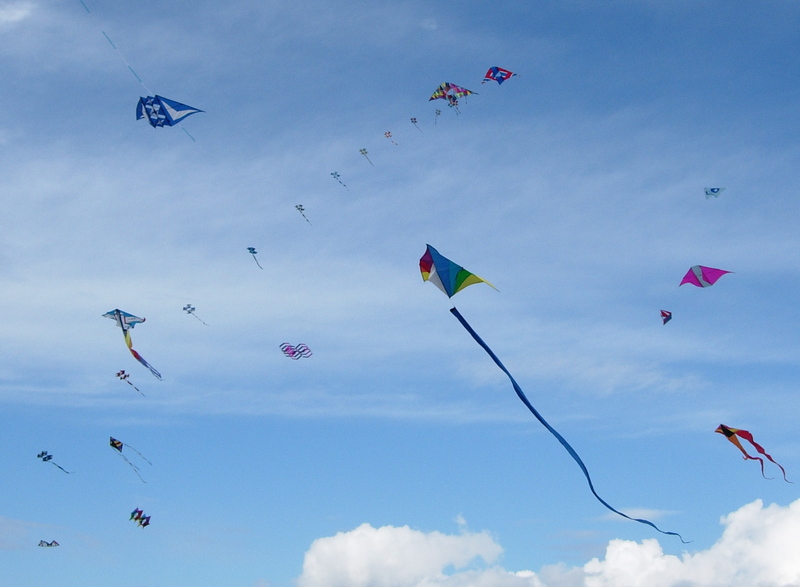 Now, years later, on a recent Saturday I went to the Whidbey Island Kite Festival. A hundred colorful shapes filled the air, dancing on the wind, swirling their tails behind them. Three-year-old kids launched their newly hand-made kites next to experienced stunt-kite fliers. I, and everyone else on that field, was caught in the spell of the enchanted relationship between a kite and a person. The unformed metaphor of twenty years ago taunted me, but remained just out of my reach – something about difficult situations, wanting to cut and run, staying connected, and . . . surely there were wise words waiting to be spoken. But on that sunny Saturday afternoon my thoughts flew away in the breeze, and I just sat there, gaping and smiling as the kites hummed and danced and smiled back at me. “No need to philosophize,” they called down to me. “Just appreciate.” And so I did. https://cynthiatrenshaw.com/wp-content/uploads/2019/03/header-new.jpg 0 0 Cynthia Trenshaw https://cynthiatrenshaw.com/wp-content/uploads/2019/03/header-new.jpg Cynthia Trenshaw2013-09-28 21:28:062013-10-01 20:02:24Go Fly A Kite!